People love Denver, and who can blame them. A hip food scene, craft breweries, legendary live music and copious, completely legal Rocky Mountain highs: it’s like a checklist of things 19 to 45-year-olds get excited about. But hold your urban urges for a moment, because it’s up in the mountains where the true heart of Colorado beats… and it’s also a hell of a lot cooler up there. Here are five mountain towns to beat the remaining city heat, brimming with stream-side wilderness trails and summertime personality. I first went to Steamboat as a horse-obsessed kid, and it was the distinct cowboy-ness of the ranch-loaded region that got me hooked. These days you won’t see too many lasso-toting riders, but you can still go on a saddle-top adventure -- a bike saddle, that is. 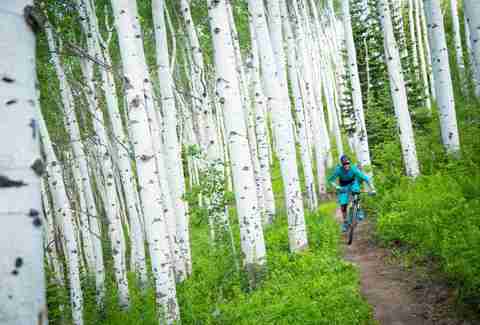 Howelsen Hill is Colorado’s oldest ski area, but in summer it transforms into a treasure trove of singletrack mountain bike trails down Emerald Mountain. Don’t get spooked by ominous names like “Lane of Pain” and “Blair Witch” -- there’s a trail for every level of rider, and they’re teeming with colorful wildflowers and sweeping views of the Flat Tops Wilderness Area. Nothing rewards a slog up and down Emerald Mountain like a cold lager at Mahogany Ridge Brewery and Grill (pair it with ceviche, trust me) or a signature IPA at Butcherknife Brewery. For date-night dinners, head to the historic Harwigs (first a drug store, then a saddlery, now a restaurant) for the expansive wine list and live lobster tank (which is a real rarity in the Rockies). As its name infers, Steamboat Springs is indeed home to a collection of natural mineral pools. If you can only choose one (poor you), go for Strawberry Park Hot Springs, a rustic oasis of bubbling water and cute cabins. The most rewarding way to experience them is by hiking the Hot Springs Trail, a gentle, three-mile walk from Mad Creek Trailhead (look for FS trail #1169). Early September is primetime for a visit, thanks to two major annual events. 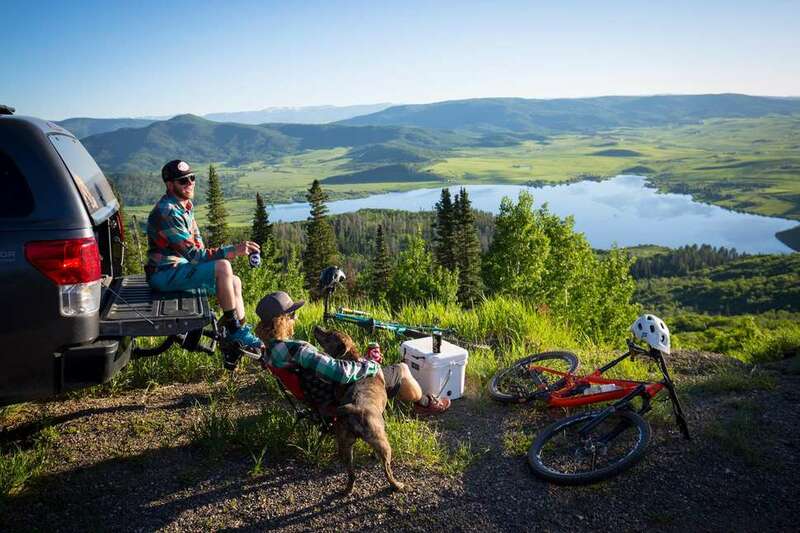 At the Steamboat Bike Festival (September 6-9), local guides lead organized rides, beer meet-ups and “trailgate” barbecues, while the Wild West Air Fest (September 1) deals in dizzying aerobatics by old bomber and propeller planes. OK, so it’s a trek from Denver (particularly if you get stuck behind a line of RVs plunking along Hwy 285), but you’ll know why Crested Butte is on this list the second it comes into view. The namesake butte is all on its own, looming over a charming mining-era town. Fine dining is off the menu here, but you can get farm-to-table hangover breakfasts at Sunflower, fresh sushi at Lil’s, and a decent cup of Joe at Camp 4. Mountain biking is a way of life. If you’re experienced and have a solid set of lungs and legs, hit the 401 Trail, which takes you high up on a narrow track through pine forests, wildflower fields and a ghost town aptly named Gothic. If you prefer to stay on two feet, try the Oh Be Joyful hiking trail to the towering falls of the same name. The annual arts festival (August 2-4 in 2019) presents the perfect opportunity to get your holiday shopping knocked out early, with unusual handmade jewelry, paintings, sculptures and clothing created by Colorado artists. And like any self-respecting small town, they’ve got a kooky Pagan festival too -- at Vinotok (September 23), the locals don flower halos and creepy costumes before gathering at a giant bonfire to burn an effigy known as The Grump. Join them on the high grade bud, and you’ll feel as if you’ve landed on the pages of Where the Wild Things Are. 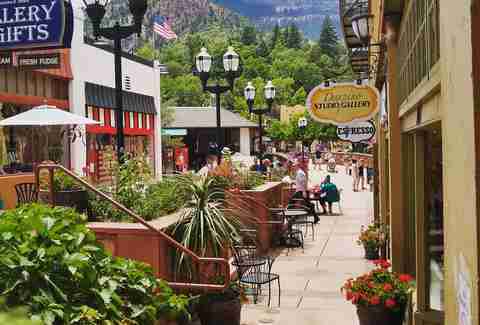 Beneath the 14,000ft Pikes Peak, Manitou Springs is basically Colorado Springs’ relaxed, hippy little sister. It comes with a signature challenge: the Manitou Incline. The 2,744 step-trail ascends 2,000ft in less than a mile, so make sure you warm up those quads and reckon on about an hour to get to the top. It passes what’s left of the old narrow-gauge funicular railway, and for the final few hundred steps it’s almost vertical, so expect to use your hands for leverage (your legs will be toast by then, anyway). After all that, you’ll need a pick-me-up. Enter, Radiantly Raw, for some of Colorado’s -- nay, America’s best handmade chocolate. Manitou Brewing is the spot for rehydration (of a sort) and plates of comfort food. It’s inside a converted 19th-century burro livery, and is the only place you can get the house beer, so you’d better make the most of it. Another beverage you should at least try is the sulphur-tinged mineral water, combined with a soak at one of the eight hot springs around town. According to local lore (and absolutely zero qualified doctors), this stuff has magical healing powers; one thing we know for sure is that it tastes like the devilled eggs you left under the sofa in 2012. One last thing -- don’t leave Manitou without doing the rounds in the historic Penny Arcade. The tight alleys and aging game rooms are chock-full of vintage games, including mechanical pinball and several skeeball runs. At 10,200ft, Leadville is the highest city in the country, so you’re safe from the summer sweats down in Denver. This is the old West at its best, with historic haunts dating back to the silver rush and no shortage of ghost stories to go with them. Take The Silver Dollar Saloon, once owned by boom-to-bust silver baron Horace Tabor. It still features the original bar mirror made of diamond dust as well as its swinging wooden doors, dating back to 1879. Rumor has it, phantoms of Horace and his mistress Baby Doe are seen to this day, cuddling up in a corner. Surrounded by the Sawatch Mountains (including the highest peak in the Rockies, the 14,440ft Mount Elbert), Leadville is a stomping ground for extreme and frankly totally nuts athletes. 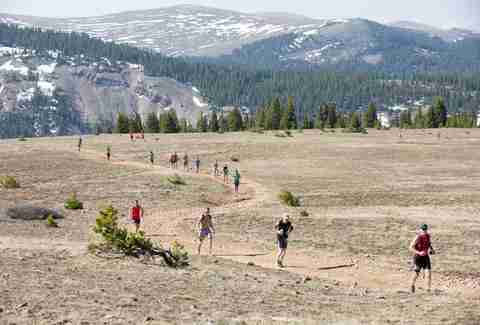 They flock here every summer for the Leadville Trail 100 mountain bike race and the even more superhuman Leadville 100 Trail Run, which climbs and descends more than 15,000 vertical feet. There’s a 30-hour time limit, and racers run through the night, rain or shine (or snow, even in August). It’s that badass that usually only half the field crosses the finish line. No matter your ambitions, you’ll want to load up on carbs. Mama Martinez serves up the best stuffed sopapillas in town at The Grill, which started life as a Louisiana Diner in 1936 but now sticks happily to cheese-laden Mexican food. 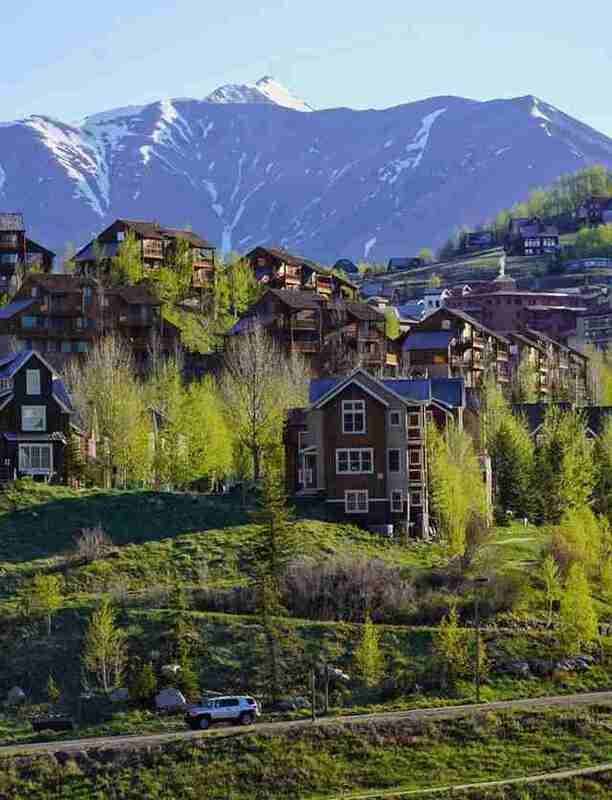 “Winters are good, but summers are why we live here,” is every local’s one-liner at this swanky resort best known for skiing. 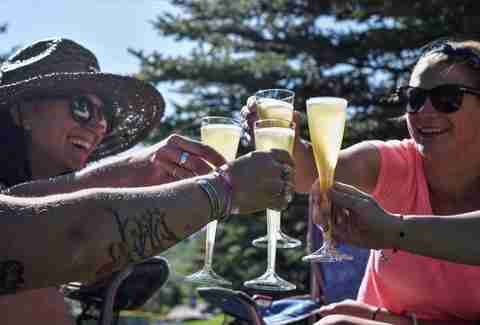 Granted, it lacks the Wild West antiquity (it was built from scratch in 1962), but Vail’s summer vibe is unmistakably enticing -- the valley is ablaze with wildflowers, you can get a bed on the cheap, and you don’t have to put up with the fur-lined brigade. For getting out in the fresh air, head to East Vail for the most scenic and robust hikes. Booth Falls is one of the shorter and more accessible trails (although the first half mile is a slog), with views of the crystal waters flowing between the dark crags of the Gore Mountains. Spend your morning basking on the rocks of the Village centerline -- Gore Creek -- with a latte from Yeti’s Grind. The Village becomes a sea of tents and bodies (human and canine… even puppies in backpacks) every Sunday for the Vail Farmers Market & Art Show -- I can personally vouch for the fruit and vegetables, local honey and, when freshly made crepes. The Vail Jazz ensemble provides a soundtrack of salsa and swing in the background. On balmy evenings, hit up Hot Summer Nights, a free concert series at the Gerald R. Ford Amphitheater, where locals gather to catch up and kids spin themselves dizzy on the lawn. To keep things even casual-er, grab beers at Vail Brewing Co. and strike some pins at Bol (it’s also an unsung foodie favorite, with a solid menu of seasonal pizzas, burgers and creative cocktails). The town’s most iconic building is also one of the most affordable places to stay -- the Austrian-chalet styled Gasthof Gramshammer (aka Pepi’s). You don’t get centralized air-conditioning, but there’s a certain charm about the shuttered windows, clumpy wooden wardrobes and dusty outdoor decks. And there’s no beating the location, next to the Children’s Fountain and in the shadow of Pepi’s Face (the Vail Mountain slope named after Austrian ski racer Pepi Gramshammer, who you’ll likely see in the evenings, wandering around his hotel). Shauna Farnell is a freelance writer based in Denver, CO. Follow her on Twitter @shaunafarnell.